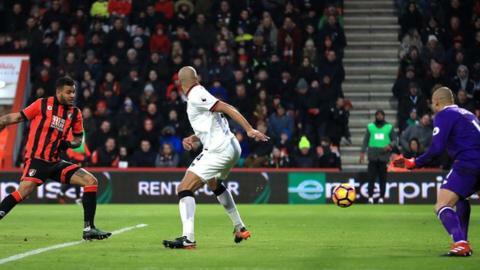 Benik Afobe scored a late equaliser as a nervy Bournemouth twice came from behind to salvage a point against Watford at Vitality Stadium. The visitors took the lead midway through the first half as Christian Kabasele headed in from a corner, following a series of errors by the hosts. Joshua King levelled soon after the interval from Adam Smith's cross, before Troy Deeney exploited more lax defending to restore Watford's lead. But Afobe grabbed a late equaliser when he ran onto Andrew Surman's through ball and finished low into the bottom corner. Charlie Daniels thought he had claimed a dramatic winner in stoppage time but his effort was correctly ruled out for a handball by Steve Cook. Bournemouth have now won just one of the last seven games in all competitions, while Watford are winless in their last seven Premier League games. With increased scrutiny on their defensive frailties, having conceded nine goals in their previous three games, Bournemouth's back four will have welcomed the early control their midfield provided before everything unravelled midway through the first half. Centre-back Tyrone Mings under-hit a backpass under pressure, forcing Artur Boruc to hack his clearance straight to a Watford player, before Ryan Fraser played another poor pass that Stefano Okaka ran onto to win a corner off Mings. From the set-piece, Steve Cook flicked the ball across his own box, allowing Miguel Britos to rise above his marker and find Kabasele in space to steer in with his head. After scoring an own goal in his first Premier League start against Hull last weekend, Mings looked shaky again, frequently conceding possession and given little protection by the rest of the Cherries defence, who were culpable for Watford's second goal. Tom Cleverley, making his first start for the Hornets since joining on loan from Everton, whipped a corner into the six-yard box that Boruc failed to deal with, as Deeney defied the attentions of three Bournemouth defenders to glance in a fine header. With Simon Francis sitting out the third of his three-game ban, Nathan Ake having been recalled by parent club Chelsea and Marc Wilson out with a hamstring injury, there are clear factors behind Bournemouth's recent defensive struggles but they will need to improve quickly to prevent a season of promise falling away. Despite all those defensive worries, Bournemouth remain a pleasure to watch going forward and, as the old adage goes, attack may prove to be their best form of defence. Forwards Callum Wilson and King came back into the side from the start and their movement provided opportunities to get in behind the Watford defence. Jack Wilshere took advantage early on as he chipped an exquisite through ball for Fraser drifting into space to loop a header over Heurelho Gomes, only for the Hornets keeper to get back and tip it over. Gomes made another couple of solid saves from Wilshere and Junior Stanislas towards the end of the first half, before the hosts levelled minutes after the break. Right-back Smith weaved his way clear down the right to pick out King to score with Gomes dragged out of position. A second goal seemed to be a formality for Bournemouth at this point, as they saw an appeal for a penalty against Abdoulaye Doucoure for handball turned down before Fraser drew a fine save from Gomes, only for Deeney to put Watford back in front. Yet Eddie Howe was prepared to gamble, sending on Jordon Ibe and Afobe. The striker checked his late run adeptly to take advantage of Kabasele lying down injured and collect Surman's pass before firing low beyond Gomes' dive. Watford may complain that Bournemouth should have put the ball out, but the hosts were within their rights to play on and ultimately claim a deserved equaliser. Afobe's equaliser means Watford have gone seven Premier League games without a win, including three draws and four losses. However, there were clear signs of improvement here as they doubled their tally of goals from those previous six games. Both goals resulted from well-worked set pieces and Walter Mazzarri's side had a clear tactic to induce panic in Bournemouth's defence, with Deeney and Okaka menacing Mings on the ball and Jose Holebas launching long throws from anywhere within 20 yards of the box. The Hornets were not just one-note though, showing some neat touches in possession as they wrested control following both goals, although they perhaps went too defensive after Deeney's goal, but were rightly not punished late on as referee Lee Mason spotted Cook's blatant handball before Daniels struck. Ultimately, this game may have been destined to finish level, with all four Premier League ties between these two sides who came up together from the Championship in 2014-15, having ended in draws. Bournemouth manager Eddie Howe: "It's a strange one for us, as we played so well in patches. They showed great character to bounce back. The goals we conceded were soft from our perspective, ours were great but it's frustrating to give cheap ones away. "We worked so hard for the goals, but we need to be better at the back for sure." Watford manager Walter Mazzarri: "I'm disappointed as we deserved to win but made two mistakes and paid the price. But overall, I am happy with the performance. "We've been playing with young players and a lot of them are growing. This is positive and we are slowly getting the team we want now." When asked about Benik Afobe's equaliser, which was scored while Christian Kabasele was down injured, Mazzarri said: "I prefer to not comment on any refereeing decisions today." All four of the Premier League meetings between these sides have ended level (0-0, 1-1, 2-2 and 2-2). Benik Afobe has netted two goals in his last three Premier League appearances for Bournemouth; as many as in 25 outings beforehand. Joshua King's goal was his first at Vitality Stadium since April (v Liverpool). Adam Smith has provided four assists in the Premier League this season; only Kyle Walker (5) has provided more among defenders. Bournemouth have a break before hosting Crystal Palace in the Premier League on 31 January. Watford travel to Millwall in the FA Cup fourth round on 29 January before they are away at Arsenal in the league two days later. Match ends, Bournemouth 2, Watford 2. Second Half ends, Bournemouth 2, Watford 2. Steve Cook (Bournemouth) is shown the yellow card for hand ball. Hand ball by Steve Cook (Bournemouth). Attempt missed. Callum Wilson (Bournemouth) header from the centre of the box misses to the right. Assisted by Jordon Ibe with a cross. Offside, Watford. Tom Cleverley tries a through ball, but Odion Ighalo is caught offside. Substitution, Watford. Odion Ighalo replaces Abdoulaye Doucouré. Jack Wilshere (Bournemouth) wins a free kick in the attacking half. Hand ball by Etienne Capoue (Watford). Substitution, Watford. Craig Cathcart replaces Christian Kabasele because of an injury. Goal! Bournemouth 2, Watford 2. Benik Afobe (Bournemouth) left footed shot from the left side of the box to the bottom right corner. Assisted by Andrew Surman. Substitution, Bournemouth. Marc Pugh replaces Ryan Fraser. Attempt blocked. Jordon Ibe (Bournemouth) right footed shot from outside the box is blocked. Assisted by Jack Wilshere. Younes Kaboul (Watford) is shown the yellow card. Attempt missed. Abdoulaye Doucouré (Watford) right footed shot from outside the box misses to the left. Substitution, Bournemouth. Benik Afobe replaces Junior Stanislas. Substitution, Bournemouth. Jordon Ibe replaces Joshua King. Attempt missed. Joshua King (Bournemouth) right footed shot from outside the box misses to the right. Assisted by Ryan Fraser. Attempt blocked. José Holebas (Watford) left footed shot from outside the box is blocked. Assisted by Tom Cleverley. Corner, Watford. Conceded by Tyrone Mings. Goal! Bournemouth 1, Watford 2. Troy Deeney (Watford) header from very close range to the bottom right corner. Assisted by Tom Cleverley with a cross following a corner. Attempt blocked. Christian Kabasele (Watford) right footed shot from the centre of the box is blocked. Assisted by Troy Deeney with a headed pass.